I’d like to share with you a story. It’s a tale of not heeding one’s own advice, leading to both embarrassment and something wonderful. This is a tale from the Amazing Spider-Man panel. Originally I had not planned on going to the panel because Getsuyobi was going to be there, and he is our go-to guy for all things Spider-Man. However, when I found out the Mark Hamill Spotlight was going to take place immediately afterwards, I knew I had to grab a seat. Don’t get me wrong, as I've said in the past, I love Spider-Man; he’s my second favorite in the Marvel U (sorry, X-Men will always come first), but we were trying to cover as much as possible and had a man in the room already. Anyway, Getsuyobi got great seats near the front, so we got to see all the action as the massive group of panelists came out. They included Dan Slott, Stephen Wacker, Ellie Pyle, Thomas Brennan, Ryan Stegman, and Paolo Rivera and it was moderated by Arune Singh, who is one of the best moderators around. The panel got underway and the fun began. During the panel, Dan Slott and Stephen Wacker, in particular, had a lot of fun with the audience. It was like being at a comedy club where the comedian starts conversing and heckling the audience. They were quite interactive and allowed the audience call out questions and comments. Midway through is when it happened. 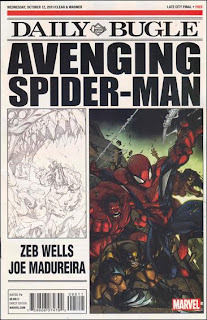 They announced Avenging Spider-Man #1 written by Zeb Wells and the return of one of my absolute favorite artists, Joe Madureira. I can’t say how much Madureira’s work has affected me. He’s one of the reasons my love of comics was so firmly cemented, so needless to say, when this was announced, I might have lost my head a little. Other articles about the panel have made mention of what happened next but no one went into detail, so straight from the horse’s mouth, here’s what happened. 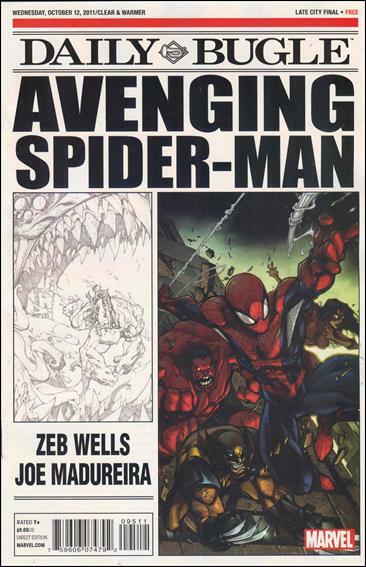 Stephen Wacker pulled out the first printed copy of Avenging Spider-Man #1 and was mocking us with it. Now, remember I said I might have lost my head, because while we were being teased with the comic, I called out, asking Wacker what he was doing after the panel. His reply was, “So, I can mock you later?” To which I responded, “I don’t know, can I mug you later?” I meant only for the comic and in the nicest of ways, but yes, I said that. There was a strong reaction from everyone, and then Wacker asked if I was a Madureira fan and a Spider-Man fan, and when I replied yes, he invited me up on the stage to read the comic. I got to sit between him and Ryan Stegman and read Avenging Spider-Man #1.